You guys....you’re going to have to trust me on this one. 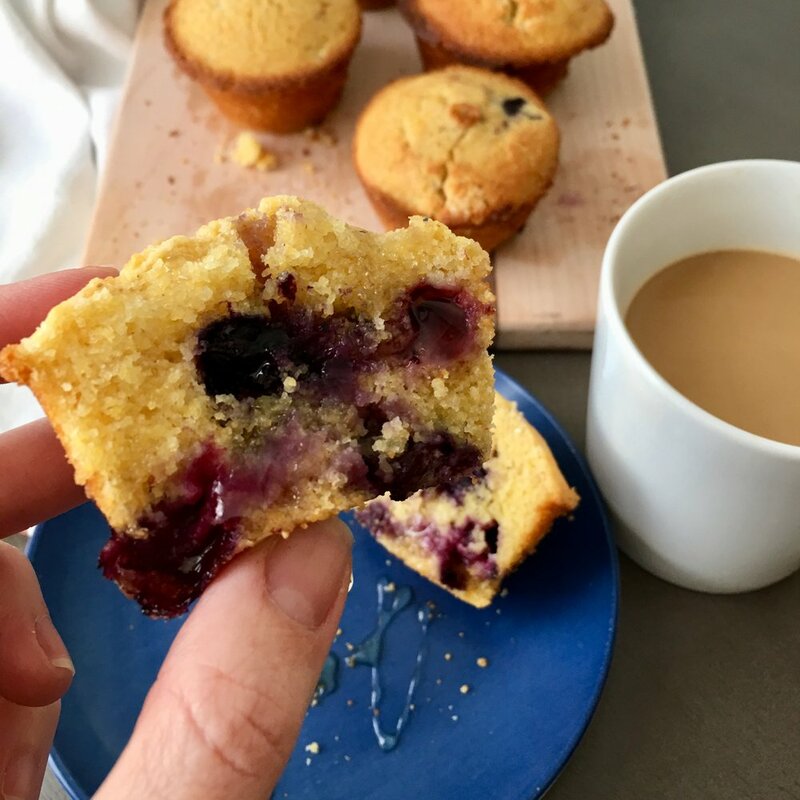 I’ve been making Giada de Laurentis’s blueberry corn muffins for a few years now, but recently tried making them completely gluten-free and was pretty impressed with the result. Usually my attempts at gluten-free baking don’t end well. I’ve tried rice flour, oat flour, or some combination of the both but they usually lead to a gummy product and a flavor I just can’t recommend. I thought this recipe might be able to go gluten-free because the cornmeal would be a familiar flavor and would help balance out the gluten free flavor and texture. I used Bob’s Red Mill Gluten Free All Purpose Baking Flour which is a combination of garbanzo bean flour, potato starch, and tapioca flour. It doesn’t have xanthum gum which I’ve used before as a binder, but it seems to be better without it, resulting in a better muffin crumb. Preheat oven to 400 F. Line a muffin tray with paper muffin cups (or spray the heck out of the pan with baking release spray). In a separate bowl, whisk together all the dry ingredients (gluten-free flour, cornmeal, baking powder, salt). Sprinkle about a tablespoon of the dry mix over the blueberries in a separate bowl, and toss to coat. Use a stand mixer with paddle attachment or electric beaters to beat the sugar and butter together. Add the vanilla. Add the eggs in one at a time and mix in, scraping the bowl down with a spatula after each addition. Add in the dry flour mix in three separate additions, alternating with the buttermilk and mixing after each addition (start and end with the dry flour mix). Stir in the blueberries by hand with a rubber spatula. 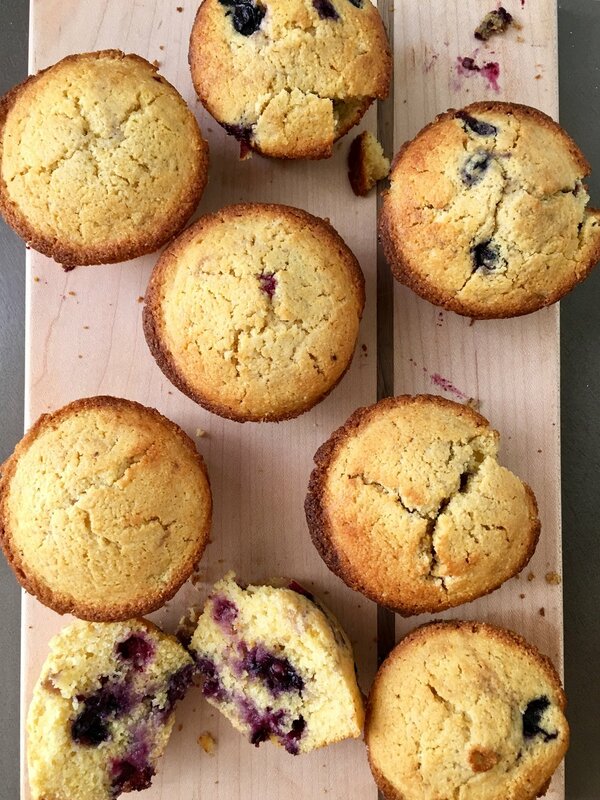 Spoon into muffin cups (you can fill almost all the way to top since these don’t rise much). Bake at 400 F for about 20-25 minutes or until the tops and edges are golden brown and a toothpick tester comes out clean. Let cool in pan for at least 5-10 minutes before attempting to remove (or they will fall apart). Use a knife to go around the edges and be gentle removing them from the pan. Cool on wire rack, and serve with honey, softened butter, or both. You can swap out the gluten free flour for regular all purpose flour if you don’t need it to be gluten free. If you don’t have any buttermilk on hand, just add one tablespoon plus one teaspoon white vinegar or fresh lemon juice to 1 and 1/3 cups regular milk and let it sit for a few minutes.